Watkins Glen International, nicknamed "The Glen", is an automobile race track located in Watkins Glen, New York, at the southern tip of Seneca Lake. It was long known around the world as the home of the Formula One United States Grand Prix, which it hosted for twenty consecutive years (1961–1980), but the site has been home to road racing of nearly every class, including the World Sportscar Championship, Trans-Am, Can-Am, Monster Energy NASCAR Cup Series, the International Motor Sports Association and the IndyCar Series. Initially, public roads in the village were used for the race course. In 1956 a permanent circuit for the race was built. In 1968 the race was extended to six hours, becoming the 6 Hours of Watkins Glen. The circuit's current layout has more or less been the same since 1971. A chicane was installed at the uphill Esses in 1975 to slow cars through these corners, where a driver died during practice at the 1973 United States Grand Prix, and removed in 1985. Another chicane called the "Inner Loop" was installed in 1992 after a fatal accident during the previous year's NASCAR Winston Cup event. The circuit is known as the Mecca of North American road racing and is a very popular venue among fans and drivers. The facility is currently owned by International Speedway Corporation. The circuit also has been the site of music concerts: the 1973 Summer Jam, featuring The Allman Brothers Band, the Grateful Dead and The Band and attended by 600,000 fans, and two Phish festivals: Super Ball IX in 2011 and Magnaball in 2015. The Watkins Glen International race course has undergone several changes over the years, with five general layouts widely recognized over its history. Currently, two distinct layouts are used—the "Boot" layout (long course) and the "NASCAR" layout (short course). The first races in Watkins Glen were organized by Cameron Argetsinger, whose family had a summer home in the area. With local Chamber of Commerce approval and SCCA sanction, the first Watkins Glen Grand Prix took place in 1948 on a 6.6-mile (10.6 km) course over local public roads. For the first few years, the races passed through the heart of the town with spectators lining the sidewalks, but after a car driven by Fred Wacker left the road in the 1952 race, killing seven-year-old Frank Fazzari and injuring several others, the race was moved to a new location on a wooded hilltop southwest of town. The original 6.6-mile (10.6 km) course is listed in the New York State register and National Register of Historic Places as the Watkins Glen Grand Prix Course, 1948-1952. The second layout 4.6-mile (7.4 km) began use in 1953 and also used existing roads. 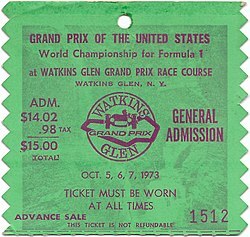 The Watkins Glen Grand Prix Corporation was formed to manage spectators, parking, and concessions. This arrangement lasted three years. The first permanent course was constructed on 550 acres, overlapping part of the previous street course. It was designed by Bill Milliken and engineering professors from Cornell University. The layout measured 2.35-mile (3.78 km). This course was used from 1956–1970. In 1968 the race was extended to six hours. The short course at Watkins Glen International with the Inner Loop. This is the layout NASCAR uses. The full Long Course with the "Boot" and the Inner Loop (1992-present). The circuit underwent a major overhaul for the 1971 season. The "Big Bend" and the turns leading up to it were eliminated, and replaced with a new pit straight. The pits and start/finish line were moved to this new straightaway. "The 90" now became Turn 1 instead of Turn 8. When the 1971 Six Hours of Watkins Glen arrived in July 1971, the overall circuit renovations were still unfinished. The short course had been finished, but the Boot segments were not complete, nor was the new pit area. The 1971 Six Hours race was run on the short course layout, and that layout colloquially became known as the 1971 Six Hours Course. In addition, for 1971 only, the cars used the original start/finish line and the old pits. When NASCAR returned to the track in 1986, they chose to use the short course layout. IMSA originally used the "Boot", but eventually, that series also began using the shorter 1971 layout. The short course was slightly lengthened in 1992 (see "Inner Loop" below). The most significant change to the track, a new segment known as "The Boot", was finished in time for the Formula One race. The start-finish line was moved to the new pit straight as planned. At the end of the backstretch, after the Loop-Chute, cars swept left into a new four-turn complex that departed from the old layout, curling left-hand downhill through the woods. The track followed the edge of the hillside to two uphill right-hand turns, over an exciting blind crest into a right-hand turn, down and up into a left-hand turn rejoining the old track. The new layout measured 3.377 miles (5.435 km). With its intrinsic link to the Formula One race, it became known colloquially as the Grand Prix Circuit. For 1972, the Six Hours sports car race also began using the full "Boot" layout. By that time, nearly all facility improvements were completed, and the pits and start/finish line were permanently moved to the new pit straight. In 1975, a fast right-left chicane was added in the turn 3-4 Esses section (called the "Scheckter Chicane") to slow speeds through the series of corners. This chicane was eliminated in the 1980s. In the early 1990s, the IMSA sports cars began bypassing the "Boot" in favor of the short course. To date, NASCAR events have never used the Boot layout. The "Long/Boot" course was slightly lengthened in 1992 (see "Inner Loop" below). In the mid-2000s, the Boot segment, which had seen little use in many years, was repaved and upgraded. When the IndyCar Series returned to Watkins Glen starting in 2005, they elected to use the Boot segment. A full repaving of the course took place in 2015, and in recent years, there has been a renewed interest and appreciation of the full Grand Prix Course layout. Consideration had even been made for NASCAR to start using the Boot. After a succession of serious crashes took place at the "Loop" at the end of the backstretch, a major change was made to the track's layout. During the 1989 Bud at the Glen, Geoff Bodine blew a tire at the end of the backstretch. He broke into a hard spin, and sailed straight off the track, crashing head-on into the barrier. In 1991, during the IMSA Camel Continental VIII, Tommy Kendall's Intrepid RM-1 prototype crashed in the Loop, severely injuring his legs. Seven weeks later, NASCAR Winston Cup driver J. D. McDuffie died in an accident at the same site during the 1991 Budweiser at The Glen. In reaction to the crashes, for 1992 track officials constructed a bus stop chicane along the back straight just before arriving at the Loop. Dubbed the "Inner Loop", it led into what was now being called, the "Outer Loop." This addition slightly increased the lap distance for both layouts. Along with the annual SCCA race, the track hosted its first professional race (NASCAR Grand National Division) in 1957. It hosted its first international event with the Formula Libre races from 1958–1960. Among the drivers participating were Jack Brabham, Stirling Moss, Phil Hill, and Dan Gurney. After two editions of the Formula One United States Grand Prix that were deemed less than successful (Sebring in 1959, and Riverside in 1960), promoters were looking for a new venue to become the permanent home for the United States Grand Prix. In 1961, just six weeks before the scheduled date for another Formula Libre race that fall, Argetsinger was tapped to prepare Watkins Glen for the final round of the Formula One World Championship. While many of the necessary preparations had already been made, new pits were constructed to satisfy European standards of pit boxes with overhead cover. Seven American drivers participated, and the race was won by British driver Innes Ireland in a Lotus-Climax with American Dan Gurney driving a Porsche 718 coming in second. Having already won both Driver's and Constructor's World Championships and still mourning the death of Wolfgang von Trips at Monza, Ferrari decided not to compete in the United States GP. Ferrari's decision not to travel to the United States for the season's final round deprived Hill of the opportunity to participate in his home race as the newly crowned World Champion, and Hill appeared only as the event's Grand Marshal. 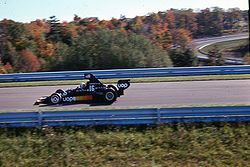 The United States Grand Prix at Watkins Glen quickly became an autumnal tradition as huge crowds of knowledgeable racing fans flocked to Upstate New York each year amid the spectacular autumn colors of the region. The race was also among the most popular on the global Grand Prix calendar with the teams and drivers because its starting and prize money often exceeded those of the other races combined. The race received the Grand Prix Drivers' Association award for the best organized and best staged GP of the season in 1965, 1970, and 1972. One fixture of the USGP at Watkins Glen was the starter for the races, Richard Norman "Tex" Hopkins. Wearing a lavender suit, clenching a big cigar in his mouth, and giving the job everything he had, Hopkins was the most recognizable starter in Grand Prix racing. Once the cars had taken their places, Hopkins strode across the front of the grid with his back to the field, turned, and jumped into the air while waving the national flag to start the race. At the finish, he would meet the winner in similar fashion, this time waving the checkered flag as the car crossed the line. Before the 1971 race, the course underwent its most significant changes of the Grand Prix era, as it was extended from 2.35 miles (3.78 km) to 3.377 miles (5.435 km) by the addition of four corners in a new section called the 'Boot' or 'Anvil'. The new layout departed from the old course near the south end into a curling downhill left-hand turn through the woods. The track followed the edge of the hillside to two consecutive right-hand turns, over an exciting blind crest to a left-hand turn, and back onto the old track. In addition, the circuit was widened and resurfaced, and both the pits and start-finish line were moved back before the northwest right-angle corner known as "The 90" and in 1975, a fast right-left chicane was added in the Esses section to slow speeds through the series of corners. Despite the improvements, the circuit became unsafe for the increasingly faster and stiffer ground effect cars of the late 1970s and a few horrendous, sometimes fatal accidents (such as those that claimed the lives of Helmut Koinigg and François Cevert). Increasingly rowdy segments of the crowd began to tarnish its image as well. Finally, in May, 1981, several months after Alan Jones had won the 1980 race for Williams, the International Auto Sports Federation removed the race from its schedule because the track had failed to pay its $800,000 debt to the teams. The Glen hosted a variety of other events throughout the Grand Prix years: from Can-Am, Trans-Am, IROC, and Endurance Sports car racing, to Formula 5000 and the CART series, these races strengthened the circuit's reputation as the premier road racing facility in the United States. From 1968 through 1981, the "Six Hours at The Glen" endurance race featured top drivers such as Mario Andretti, Jacky Ickx, Pedro Rodríguez, and Derek Bell. Different races were sometimes featured together on the same weekend (e.g., Six Hours and Can-Am) and drew sizable crowds, but without a Formula One race, the circuit struggled to survive. It finally declared bankruptcy and closed in 1981. For two years, the track was not well maintained and hosted only a few SCCA meets without spectators. In 1983, Corning Enterprises, a subsidiary of nearby Corning, partnered with International Speedway Corporation to purchase the track and rename it, Watkins Glen International. In 1986, the top NASCAR series returned to Watkins Glen after a long layoff, holding one of only three road races on its schedule (two beginning in 1988), using the 1971 Six Hours course, raced when the new section off the Loop-Chute was not finished in time. As the cars come off the Loop-Chute, instead of making the downhill left into Turn 6, the cars shot straight through the straight, and headed toward Turn 10, as was the case from 1961 until 1970. NASCAR Busch Series (now called Xfinity Series) action would arrive in 1991 with a 150-mile (240 km) race on the weekend of the Camel Continental, won by Terry Labonte, who would be a master of the circuit during its Busch Series races, winning the inaugural race, and winning three consecutive races from 1995 until 1997. The 1995 race would be the first conducted as a 200-mile (320 km) race, and became the first Busch Series race to be televised on broadcast network television, as CBS broadcast the race live until TNN took over in 1997. Only twice—1998 and 1999—did a Busch Series regular driver win the race. The first seven races were won by Winston Cup Series (Now Monster Energy NASCAR Cup Series) regular drivers, sometimes referred as "Buschwhackers", during their off-week. In 1998, the race went against the Cup race in Sonoma, California, eliminating the idea, and stayed that way until 2000. In 2001, the race was run the day after the first Saturday in July. The race was eliminated from the schedule after the 2001 season, however, only to return in 2005 as an undercard to the Nextel Cup (now Monster Energy NASCAR Cup Series) race. A pair of incidents which took place in 1991 resulted in a massive overhaul of the circuit's safety. During the IMSA Camel Continental VIII, Tommy Kendall's prototype crashed in Turn 5, severely injuring his legs. Seven weeks later, NASCAR Cup Series driver J. D. McDuffie died in an accident at the same site in the 1991 Bud at the Glen. Track officials added a bus stop chicane to the back straight in Spring 1992. In 1996, the Glen Continental reverted to a six-hour format, and was once again called the Six Hours at the Glen with the IMSA format, and stayed there until a split in American sports car racing. In 1998, the race became an event sanctioned by the Sports Car Club of America under their United States Road Racing Championship. In 1999, the FIA GT series staged a 500 km race of three hours with some USRRC entrants after USRRC canceled the last two rounds of their season before their six-hour event at the track. The following year, the six-hour race returned once again with the newly founded Grand American Road Racing Association (Grand-Am) sanctioning the event. The event is now sanctioned by IMSA with the WeatherTech SportsCar Championship. The six-hour race is now the third part of the four part North American Endurance Cup series. In 1997, International Speedway Corporation became the sole owner of the course, as Corning Enterprises believed they had completed their intended goals to rebuild the race track and increase tourism in the southern Finger Lakes region of New York State. The circuit annually hosts one of the nation's premier vintage events, the Zippo U.S. Vintage Grand Prix. When the fiftieth anniversary of road racing in Watkins Glen was celebrated during the 1998 racing season, this event was the climax, returning many original cars and drivers to the original 6.6-mile (10.6 km) street circuit through the village during the Grand Prix Festival Race Reenactment. After a 25-year layoff, major-league open wheel racing returned to the track as one of three road courses on the 2005 Indy Racing League schedule. In preparation, the circuit was overhauled again. Grandstands from Pennsylvania's Nazareth Speedway, which had closed, were installed, the gravel in The 90 was removed and replaced with a paved runoff area, and curbing was cut down for the Indy Racing League event. Previously, the high curbing in the chicane had become a place where Monster Energy NASCAR Cup Series cars would bounce high off the curbing, creating an ideal opportunity for cars to lose control, and to slow cars. Other areas of the track received improvements as well: the exits of turn 2 (the bottom of the esses), the chicane, turn 6 (the entrance to the boot), turn 9, and turn 11 all had additional runoff areas created and safety barrier upgrades. The carousel run off was paved, as well as turn 1 (the 90) and the esses were paved in the winter of 2006–07. Augmenting what was already in place along the front stretch, additional high safety fences were installed on the overpasses crossing the service roads at the top of the esses and just out of the boot immediately after the exit of turn 9. Cars drive through the Esses during the 2014 Sahlen's Six Hours of The Glen. Another overhaul for 2006 made fundamental changes to the circuit for the first time since 1992. Officials installed a new control tower, which includes booths for the officials, timing and scoring, television and radio (the new position allows broadcasters to see more action from Turn 10 through the foot of the Esses), and the public address announcer on top of the new front stretch grandstand, moving the start-finish line farther ahead of the bridge, as the start-finish line is moved 380 feet (120 m) farther toward The 90 in order to accommodate the new timing and scoring post. The new start-finish line also meant the starting lights used for club races were moved farther ahead, creating more action off Turn 11 as tactics changed with the later finish line, where slingshot moves could become paramount to the finish. A new media center was constructed to replace the former building, which also had been the control tower with the 1971 improvements. The aging structure had been the bane of many professional media members during those years with many uncomplimentary things published and broadcast about its inadequacies, especially the lack of insulation, air conditioning, few (if any) amenities that other facilities had, which resulted in race control moving to the new control tower at the start-finish line in 2006. Plans were made to move the new media center back in order to allow a full 43-car NASCAR grid. Other changes to the infrastructure included the purchase of adjoining property. Most of Bronson Hill Road was incorporated as a service road to the facility. A new section of Bronson Hill leading up from NY 414 was built as the main ingress road to the facility, bending south at Gate 6 and continuing to County Road 16, just south of the credentials and sheriff's office buildings. Track safety also is changing always and constant training is needed. Race Services Inc. provides the track with volunteers to work Fire-Rescue, Medical, Grid personnel, and Corner workers to help keep both the drivers and spectators safe. The Argetsinger family is an advisor to the circuit, and the track named the trophy for the inaugural Watkins Glen Indy Grand Prix presented by Argent in honour of the late patriarch, Cameron. On March 6, 2007, just before 9 pm, fire destroyed the recently remodeled Glen Club situated on top of the esses. Originally called the Onyx Club (named for the sponsor, Onyx Cologne), the Glen Club was used primarily as an upscale venue for race fans. After being recently remodeled, it was being advertised as a social venue for locals to use for weddings, business meetings, etc. No cause could be determined and the building was a total loss. The loss included irreplaceable, unique original motorsport artwork donated to the facility by several artists along with other racing memorabilia. Glen officials were quoted in local media stories as being adamant that the loss of the Glen Club would not affect the 2007 racing schedule. For 2007, Watkins Glen International again made improvements to the facility, specifically the track surface. All of turns 1 (the "90"), 5 (the "Loop-Chute") and 6 (entry turn into the "Boot") were repaved. A temporary "Glen Club" replaced the permanent structure destroyed by fire at the races in 2007 which was replaced with another permanent building. New sponsors for both the INDY and NASCAR weekends were signed to multi-year deals. Camping World became the sponsor of the "Camping World Grand Prix" INDY weekend at the Glen through 2010. The NASCAR weekend at the Glen received a double shot—Zippo Manufacturing announced a three-year extension of the Busch-Nationwide Series race, the "Zippo 200". The NASCAR Cup Series race became known as "The Heluva Good! Sour Cream dips at the Glen". Additionally, Brad Penn lubricants of Pennsylvania (former Kendall Oil refinery) was announced as the sponsor of the annual vintage sports car weekend for 2007 and 2008. IndyCar took a six-year hiatus from the facility when the series pulled out of the Glen after 2010 due to a dispute with track owner ISC. In June 2011, Tony Stewart and Lewis Hamilton participated in the "Mobil 1 Seat Swap". Stewart drove his No. 14 Mobil 1 Chevy for four laps around the circuit while Hamilton drove the MP4-23, Vodafone McLaren Mercedes's entry in the 2008 Formula One season. After some time, both drivers swapped cars and drove more laps around the circuit. The event was open to the public and it was hoped that it would renew interest in the track. Before this event the curbs on some of the turns were changed, the white rumble strips being replaced by the more common, red-white designs seen on most road courses around the world. In July 2011, WGI hosted a Phish concert. This is the first concert that WGI has held since the Summer Jam. In October 2012, the track suffered damage from Hurricane Sandy, with damage reported to be up to $50,000. Prior to the 2014 season, the track was cleaning out a storage barn on track property when the original Dunlop Bridge was found. The bridge was originally used as a VIP area for Dunlop until being moved for use as the starters stand years later. It was taken down and replaced by a new starters stand during renovations in 2006. The bridge was put back up at the exit to the 90 near the original location where it once stood near the original start/finish line for the track and is now once again used for VIP use by companies on race weekends with the company sponsoring the bridge. After the 2014 racing season, it was announced that the 2015 racing season would conclude with the NASCAR weekend in early August. This was to allow for a complete repaving of the track. The repave involved removing the entire racing surface. In some places, the track was taken down to the dirt road bed. This was funded not only by International Speedway Corporation, but with a grant from New York State. In March 2015, owing to the success of their previous concert, Phish said they would do another concert at WGI in late August. In August 2015, with repaving already having taken place in the Boot, NASCAR announced that they are considering running the full Grand Prix Course. 2016 would see the return of IndyCar racing to Watkins Glen, with the track being added to the schedule following the collapse of plans for a street race in Boston. It was held over the Labor Day weekend and used the full layout: ICS officials were also in negotiations with WGI to race there on a permanent basis. ^ "Watkins Glen International Track News, Records & Links". jayski.com. jayski.com. Retrieved March 5, 2016. ^ "Watkins Glen International partners with I LOVE NEW YORK to present Monster Energy NASCAR Cup Series race - Watkins Glen International". www.theglen.com. Retrieved 1 July 2017. ^ Santelli, Robert (1980). Aquarius Rising. New York: Dell. ISBN 978-0-440-50956-1. , cited in Strycharz, Robb. "Watkins Glen "Summer Jam" Archive". Chronos. Archived from the original on 2 August 2011. Retrieved 2 August 2011. ^ "Map of Original Watkins Glen Grand Prix Circuit, 1948 - 1952". www.grandprixfestival.com. Retrieved 27 December 2018. ^ National Park Service (2009-03-13). "National Register Information System". National Register of Historic Places. National Park Service. ^ "NASCAR may get 'the Boot' at Watkins Glen". nascar.com. Retrieved 1 July 2017. ^ "Watkins Glen Loses Race; Track Failed to Pay Debts". The New York Times. AP. 8 May 1981. Archived from the original on 2 August 2011. Retrieved 2 August 2011. ^ Bandoim, Lana (2012-10-31). "Hurricane Sandy Affects NASCAR: Fan View". Yahoo! Sports. Retrieved 2012-10-31. ^ Reid Spencer. "NASCAR may get 'the Boot' at Watkins Glen". NASCAR.com. NASCAR Media Group, LLC. Retrieved 10 August 2015. ^ Cavin, Curt (May 13, 2016). "IndyCar series to race at Watkins Glen". The Indianapolis Star. Indianapolis: Gannett Company. Retrieved May 13, 2016. ^ Associated Press (2013-08-10). "Marcos Ambrose wins Cup pole". ESPN. Retrieved 2013-08-12. ^ "Frisselle, AIM Autosport to Start from Pole in Crown Royal 200". theglen.com. Retrieved 1 July 2015. Wikimedia Commons has media related to Watkins Glen International.